With our unique Minkyti® Facial*, we combine expert techniques that go to the core of what’s causing skin to weaken and age. No other method is as comprehensive in naturally stimulating your complexion to look its best. 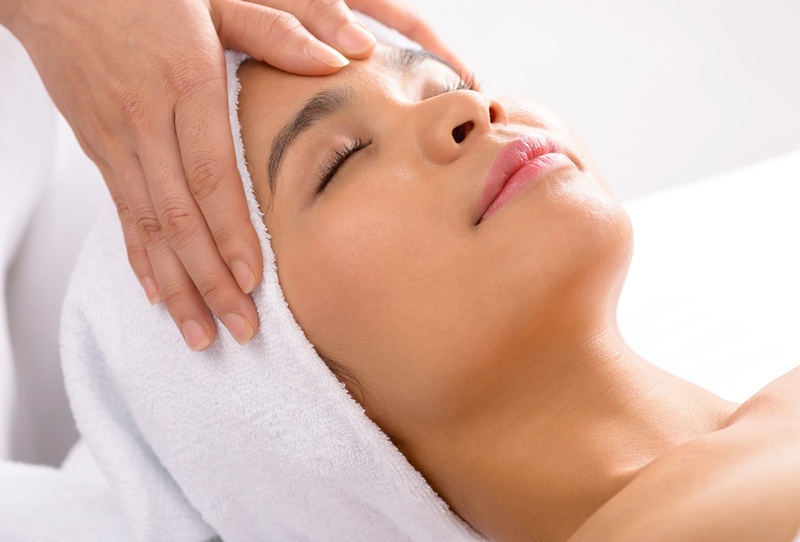 Deep cleansing and exfoliation are combined with shiatsu pressure point and connective tissue massage to increase circulation to the connective tissues of the face, neck and décolleté area, allowing for greater penetration of nourishment directly into the skin. A custom algae mask, infused with 100% pure essential oils, is applied for ultimate remineralization and relaxation. Results can immediately be seen and felt. You will experience the return of a youthful glow, the visible signs of aging will begin to diminish, and your spirit will feel rejuvenated. WHO SHOULD GET A MINKYTI? Simple. Anyone with ultra-dry or mature skin in need of some extra TLC. The facial is also excellent for before and after surgical procedures, chemical peels, and/or microdermabrasion. Alginic acid in the seaweeds used in the Minkyti affects fibroblasts in the skin, which is where the body’s natural production of collagen and elastin occurs. By increasing collagen and elastin production, the skin is suppler and strengthened to withstand these extreme treatments. Our innovative Minkyti facial is invigorating for all the senses. It is truly a holistic treatment that not only benefits the skin, but revitalizes the mind and spirit as well. Here are just a few of the benefits that you can expect. Yes, you will look fabulous, but you will feel even better. Taking the time to care for your precious face with the help of well-trained, thoughtful technicians, natural aromatherapy techniques, and good-for-you products, will enhance your health long after you leave the spa. These unique holistic approaches are what make the Minkyti spa experience unlike any other you have tried before. WHAT MAKES THE MINKYTI UNIQUE? Our special Acupressure Technique is based on a method called Oriental Analysis. The routine is designed to stimulate the Organ Reflex Zones of the face … like reflexology for the face. The Organ Reflex Zones translate to various parts of the body. By applying the Acupressure Technique you can directly address those areas that are carrying stress just as you would in hand and foot reflexology. With the acupressure, we are stimulating and/or balancing the reflex zones to enhance your body’s overall balance. When your body is balanced, it is more relaxed and able to work more efficiently. The word Minkyti is derived from a Czech word which means “to knead.” The Connective Tissue Massage is a lifting technique that releases fascia and breaks up adhesions which reduce the appearance of tension lines, aging lines and wrinkles. This creates a more natural and lasting effect than injections and chemical alternatives. Using products formulated with high-quality, naturally-effective ingredients is a critical element for result-oriented therapies. The Minkyti Facial focuses on reducing the visible signs of aging through the use of specific products carefully chosen to achieve this focus. The Source Vitál Apothecary product line incorporates the science of essential oils and thalassotherapy (use of algae/seaweed) to produce lasting results in the condition of the skin. These ingredients work with the skin, not against it. By taking an active, yet gentle approach, the skin’s natural healing abilities are encouraged, without the risk of irritation or inflammation. Hydrating and Remineralizing – As a general rule, most people are superficially dehydrated. Why? Because they do not drink enough water nor possess enough nutrients, in the form of trace elements and minerals, to maintain hydration. These nutrients are found in plants we consume or through products we use on our skin. They can also be found in essential oils and seaweeds. We use specific essential oils known to assist in the hydration and remineralization of the skin. Oxygenating – Essential oils are a concentrated form of plant material, and as such they possess significant amounts of chlorophyll. When introduced to the human body, chlorophyll increases oxygen levels, assisting in the delivery of oxygen to tissues. This kick starts the body’s natural renewal processes and stimulates the skin for a complexion that looks more youthful. Detoxification – By increasing hydration and oxygenation through the use of essential oils, we have the ability to achieve more than a surface-level detoxification; we can penetrate below the skin and get to the cellular level. Keeping the skin clean and purified keeps toxins from breaking down healthy, youthful cells. Nutrition – The nutritional component is important when considering the therapeutic benefit of seaweed. Seaweed is an algae, and algae is one of the most nutrient-rich organisms on the planet; it is the first link in the food chain. This concentration of vital nutrients is what makes seaweeds so effective in therapies. The body easily recognizes their chemical composition and can readily take in those nutrients, quickly putting them to use. The Minkyti employs Laminaria Digitata, which is one of the most effective seaweeds from a therapeutic perspective. This seaweed is one of the few, if not only, “foods” in the algae kingdom that contains every vitamin, mineral, trace element, amino acid and enzyme our bodies need to maintain balance and optimal health. Chelation – This is defined as the ability of one substance to bind to another. Seaweeds attach and bind their molecular structure to toxic metals and other harmful elements, eliminating them from your body. Through the infinite wisdom of nature, the seaweeds do not affect beneficial elements in the body. By promoting the removal of toxins, the lymphatics are stimulated to flush, or drain, any trapped toxins and excessive water that can damage connective tissues. This is another reason seaweed is such an important component of the Minkyti. By helping the body to naturally rid itself of toxins, it allows the body to spend its energies on healthy cellular renewal. Circulation & Oxygenation – In addition to remineralizing the skin, seaweed applications and masks encourage the vasodilation of capillaries in your skin’s tissues. Stimulating circulation brings life-giving oxygen to the cells, speeding the body’s ability to heal and make new, young, well-functioning cells. Metabolism – Seaweed also allows your body’s own fat burning enzymes to gain access to stubborn cellulitic tissues, speeding up metabolism. Science and years of experience come together to make the Minkyti the ultimate retreat. Visit us at besanctuary.com to schedule your time to relax and rejuvenate. The Minkyti Facial lasts 90 minutes and costs $175. For best results, we recommend you start with a series of six, once a week for six weeks. *Minkyti is a registered trademark of Source Vitál, LLC.